(Nanowerk News) At a surface or interface the electron spin can form specific patterns but it remains in the surface plane. Helmholtz Zentrum Berlin (HZB) researchers have now succeeded in turning the spin out of the plane, and they explain why this is a principle property. The results were published on 27. July 2015 in Nature Communications ("Tunable Fermi level and hedgehog spin texture in gapped graphene"). They are building on previous work published earlier in 2011 in Physical Review B ("Effect of sublattice asymmetry and spin-orbit interaction on out-of-plane spin polarization of photoelectrons"). If an electron bounces back from an obstruction it runs, as one should think, exactly back the way it came from. Quantum mechanics, however, has its own rules when it comes to electrons and particularly when it comes to electrons in graphene. When an electron in graphene runs head on against an obstruction and is scattered back, it does change it course by 180°. Its spin, however, should also turn by 180° but it rotates only be 90°. Indeed, an electron has to be rotated by 720° to get it back into its original states. To do this experiment, several preconditions have to be met. First of all, the electron spin property has to be imparted on the graphen. Varykhalov and coworkers have much experience since they succeeded in this in a remarkable experiment in 2008. They squeezed gold atoms underneath the graphene und thereby enhanced the spin-orbit interaction in the graphene by a factor of 10,000. Precondition no. 2 is to allow for the 180° backscattering. This is challenging since graphene is first and foremost famous the absence of backscattering. To this end, Varykhalov et al. created a band gap in the graphene. This means nothing else than sending electrons back by 180°. If both is fulfilled, the spins in this band gap have to be oriented perpendicular to the graphene plane, more far away, however, in the plane. The continuous transition between the two has the appearance of the prickles of a hedgehog. Model calculations have been performed by theoreticians from Budapest and confirm the experimental results. For symmetry reasons the hedgehog structure has to be reversed elsewhere in the graphene. This does not mean that the hedgehog had no influence on the graphene. On the contrary, the so-called valley Hall effect can be used to realize a spin filter. This effect means that the electrons in the graphene are deflected to the right or left depending on which valley they are in. Because according to the results by Varykhalov et al. 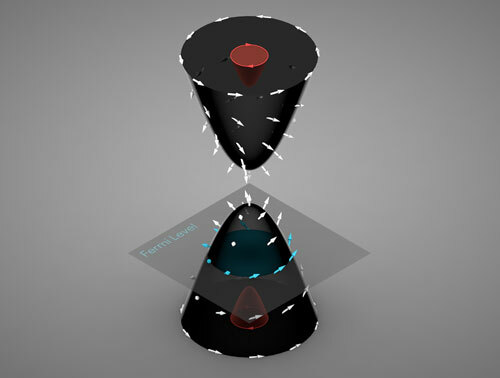 the two valleys correspond to two spin orientations, the two spins assemble at opposite sides of the graphene sample.